This was on my Best of 2012 as the best body cream, so I thought it was time to review it and tell you why I love it so much. This lovely tub of moussy goodness smells good enough to eat. 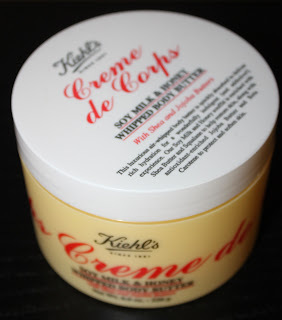 I can just imagine little bee's a' la Willy Wonka working themselves into a frenzy churning this glorious cream in to it's luscious state of creaminess. Okay- so enough whimsical nonsense! All these ingredients put together make for a nourishing body cream that quenches my dry skin. I use it at night for extra comfort. Its whipped consistency is easily absorbed into my skin and does not leave any 'film' on top of my skin, indicating it has been absorbed well. It has a sweet scent that if worn during the day gives off a light fragrance, that negates the use of a perfume. For me it smells indulgent and makes me feel like I am on holiday in the caribbean ( I wish...). This is the perfect night body cream for summer or winter, which delivers continuos moisture. Apply on damp skin for easier application and to seal in moisture. I do opt for a more lightly scented body cream for the day, as not to interfere with perfumes I want to wear. This cream can do no wrong in my eyes and checks all the boxes for the perfect hydrating body cream.